Toronto Housing - Unaffordable as Ever! Hooray! Toronto's housing market did not crash in 2013. But wait - it gets better worse! The average home price in the GTA rose by $26,000 (5.2%) in 2013. Now add the fact that the median gross household income in Toronto declined to $73,100 in 2013 compared to $73,300 in 2012 and you have truly a disastrous year for Toronto real estate (especially if you are a first time home buyer). You know the saying "the rich get richer and the poor get poorer". The new saying should be "the old get richer and the young get more indebted". Rising home prices is nothing else but a generational transfer of wealth! Not only is growing national debt forced upon future generations, but now the younger generations have to pay record level prices for housing with incomes equivalent to the late '70s. It seems that today's 20 somethings can only afford a tiny shoebox overlooking the Gardiner. Apparently that's a perfect place to raise a family - which comes with the added bonus of increasing your chances of developing cancer! But hey, Toronto is becoming Manhattanized. 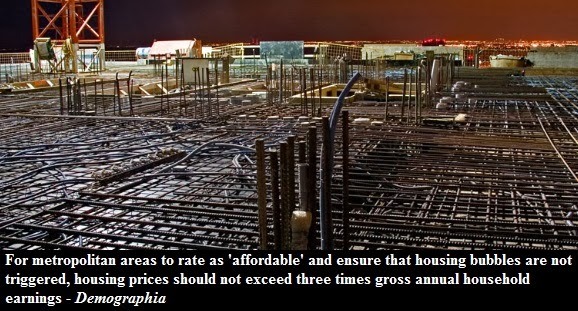 Well, in terms of unaffordability, it sure is. According to the 10th annual Demographia report, Toronto shares a 10th place spot with New York in terms of how unaffordable real estate prices are in metropolitan areas with over 2 million residents. 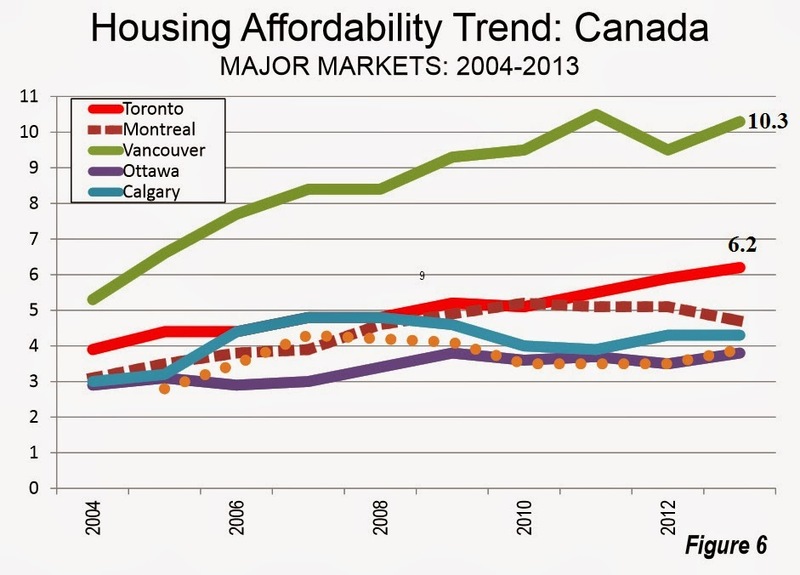 Yes, we are not Vancouver, the 2nd most delusional city on the planet in terms of housing affordability. Yet in Canada, Toronto is a runner up. 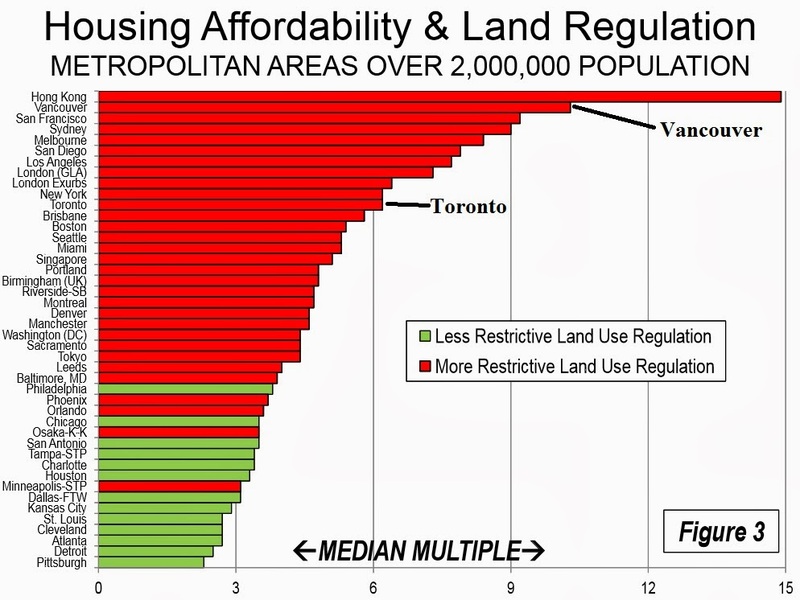 According to Demographia Toronto's real estate unaffordability reached the highest level ever in 2013 as based on the median multiple measure of 6.2. During the 3rd quarter of 2013 the median home price in Toronto was $453,900 while the median household income was $73,100. Historically speaking home prices in Canada, New Zealand, America, Australia and the UK had a median multiple of anywhere between 2 and 3. That is, a median home was worth approximately 2 or 3 times the median household income. In the past ten years all of that has changed. 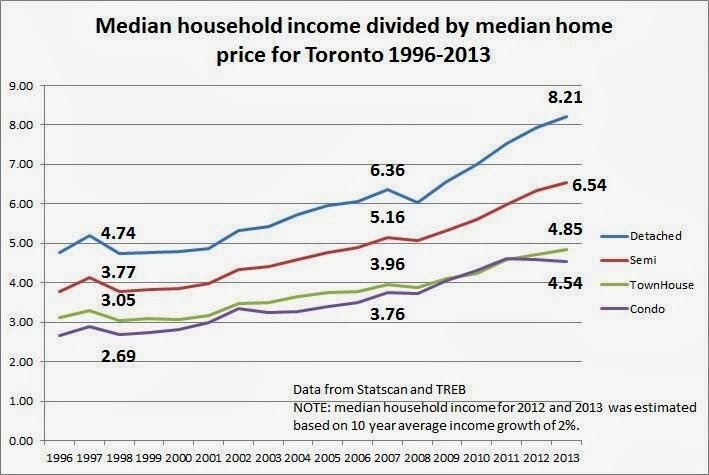 Presently in Toronto the median home is worth 6.2x the median income which is considered severely unaffordable! "More elaborate indicators, which mix housing affordability and mortgage affordability can mask the structural elements of house pricing are often not well understood outside the financial sector. Moreover, they provide only a "snapshot," because interest rates can vary over the term of a mortgage; however the price paid for the house does not. The reality is that, if house prices double or triple relative to incomes, as has occurred in many severely unaffordable markets, the sum total of mortgage payments will also rise substantially."